CDM535 Group Blog! Assignments and such and so on and etcetera will be posted here. We consist of Danielle Wright, Elaine Martin, Danialle Dube, and Gina Tiret. As more data is being collected about our daily lives, bringing some of it together can be a positive thing for society. 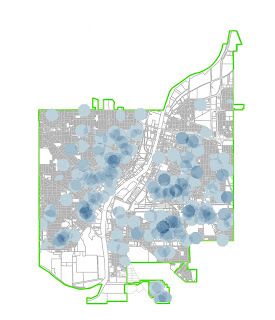 Today, the City of Saginaw is compiling and analyzing code enforcement violations, ownership and rental license information, and crime data to identify areas that are less desirable to live. By using geographic information systems (GIS) to geocode the locations of these properties, we are able to perform spatial analysis to determine the areas of concentration of the most destructive activities and highest crime rates. Currently, one such neighborhood has been identified and a multi-tiered assault is being deployed. First, the panoptic effect is utilized by informing the public of Shotspotter technology that can identify and locate gunfire. Signs are posted that notify citizens and visitors that the area is under video surveillance. These cameras are also connected with the Shotspotter equipment in order to pan to, locate, and monitor the areas identified having gunfire. Officers are immediately notified and sent to the area decreasing response times. Increasing the surveillance in the neighborhood can lead to a decrease in the number of crimes committed in the area due to fear of being witnessed and prosecuted. Second, data from the Assessor's Office and Customer Accounting is analyzed including whether the primary residence exemption (PRE) or homestead exemption is claimed, if there is monthly water usage, and the name on the water bill to determine if the property is likely being used as a rental instead as of an owner’s residence. The inspections division then visits the suspected rental properties in the area to determine whether they are in fact rentals, and if so, conducts an inspection to determine if the property is up to code. The owner is notified then that a non-owner occupied license and yearly inspections are required for the property. Failure to comply with this regulation can eventually lead to the property ownership reverting back to the Saginaw County Land Bank and possible sale for redevelopment. This action reduces the number of poorly maintained rentals and helps to increase the quality of life for the occupants. Lastly, using the global gaze of aerial imagery and GIS data analysis, pockets of code violations have been identified and tickets issued to help clean up the properties. Violations such as not keeping grass cut, having rubbish improperly placed at the road, junk vehicles and using property for other than its intended use, such as having cars parked in the front yard, are being enforced since they all contribute to a decreased sense of value of and in the neighborhood. By fighting this blight, residents are encouraged to maintain their properties since it will contribute to the well-being of the neighborhood and again increase the quality of life. These three instances of invasive technology can assist the City and residents in rebuilding a neighborhood that had become a slum with improperly maintained homes, high crime rates and little to no curb appeal. Although this project is still in its early stages the benefits of bringing together data, gathering images and video, and creating maps can be seen to serve the needs of society.